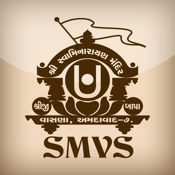 SMVS Satsang is the perfect app provided by SMVS organization for human being to fulfill/complete their daily rules provided by Load Swaminarayan and to see upcoming event updates from SMVS. * Daily Darshan: Look at daily darshan of Load Swaminarayan presented in different temples and for different dates. * Today's Prayer: will show today's prayer to follow, so no need to remember all the prayers of month. * Meditation: Visulization of load swaminarayan murti and pieceful MP3 play for load swaminarayan dhyan. * Vachnamrut: read 273 principal scripture of the Swaminarayan Sampraday with zoom feature and have auto bookmark feature where you last read in listing. * Bapashri ni Vato: complete collection of Jeevanpran Shree Abji Bapashree's discourses given in this section similar features like Vachnamrut section. * SMVS Video: Video collection of all different event handled at SMVS under different categories. * 5 Minutes Sansang: Same as SMVS Video section but with solution to all your questions with short video clips. * SMVS Audio: Audio collection of all different event handled at SMVS under different categories with kirtans in audio fomat. * Updates: Past and upcoming event updates of/from SMVS.